I knew there was a reason I'd waited so long to make this recipe: my distaste for red peppers (albeit, roasted) made me hesitant, but the combination of fresh mozzarella, basil, and balsamic vinegar seemed promising. I should have stuck with my first instinct! This dish could have been good, but it's something that I think would be better paired with tomatoes, for your classic caprese flavors. 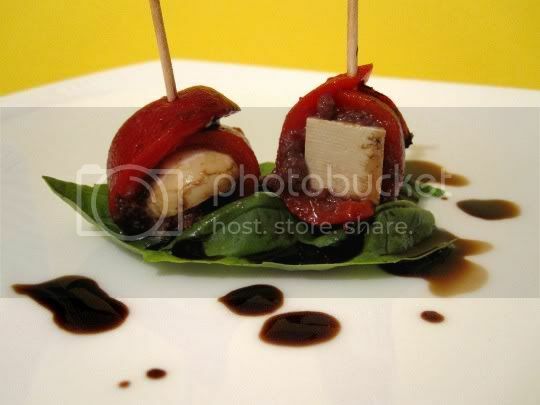 Roasted red peppers are cut into strips, spread with black olive paste (tapenade), and rolled around baby mozzarella balls (bocconcini) - or for a vegan version, cubed tofu. The basil isn't actually incorporated into the roulade: rather, it's used as a garnish or lining. I rolled a few of the pieces with torn basil leaves, because without it, they were pretty bland. Balsamic vinegar is cooked down and reduced to a syrup, which is then drizzled on the roulade pieces...and this (along with the basil) proves to be the saving grace for this dish. Otherwise, the red pepper is a strange slippery texture, the mozzarella is rather bland, and the olive paste only adds a brief saltiness. But the basil adds a fresh herbal flavor, and the balsamic adds a much needed sweetness and tanginess. At least something about this dish was good. Make again? Probably not...unless I adapted the recipe to swap the peppers with tomatoes, and incorporate the basil in the actual roulade.